The phone has 2 Valid IMEI No with 3.2"LCD Touch Screen Display of 240*320.
n5800i has Dual Digital Camera of high definition and other special features like MP3/MP4/3GP, Shake to change Wallpaper & Songs, FM Radio. 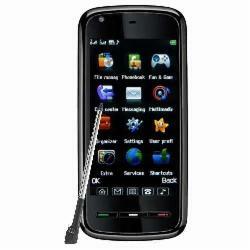 The mobile n5800i also supports Micro SD Card up to 32GB & Inbuilt Memory 500 KB ROM, A2DP Bluetooth, Internet, GPRS. As per the reviews over the net it is a great and smart looking handset which has a wide touch screen and cutting edge designed body for a good feel in the hand. The n5800i is loaded with applications and a digital dual camera , one in the front and one at the back. You can click pictures at all possible angles. There are 4 sims in the phones but only two can work at a time and two are standby. This multimedia phone also supports mp3 music player as well as an fm radio inside. The phone also has long hours of battery life. WWAP and GPRS are ideal for web browsing. This phone also supports a 32GB micro SD memory card. 4 sim mobile, Charger, Ear phone, Battery, Manual and stylus. Rs 299 for shipping will be applied extra. With all these specifications and the pricing, I feel that it is a very good bargain.